(N.F.A.P.C.) 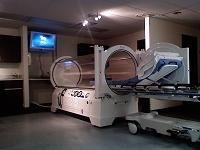 is a new state-of-the-art treatment and hyperbaric center in Orange Park, Florida. As Medical Director, Dr. Rodriguez supervises N.F.A.P.C. He graduated Ponce School of Medicine in Ponce, Puerto Rico in May, 1995. His post graduate training, including his internship and residency, took place at the University of South Florida in Tampa from July, 1995 through June, 1998. He has held many honors and awards including the All American Collegiate Award in 1993 and the Ethics and Family Medicine Honor in 1992. Dr. Rodriguez is board certified and licensed in the State of Florida. Our technicians are trained in hyperbarics. Our staff will evaluate and track each individual’s specific needs with hyperbaric oxygen therapy (HBOT). We are able to assist you with your insurance coverage. Dr. Bober specializes in Full Foot and Ankle Reconstructive Surgery, and Diabetic Limb Salvage. He excels in Wound Care and Amputation Prevention as well as Full Foot and Ankle Reconstructive Surgery, and Diabetic Limb Salvage. Our Center is open for appointments at the convenience of our patients. Monday – Friday 8:30 a.m. to 7:00 p.m. and Saturday & Sunday 10:00 a.m. to 5 p.m. Hours are by appointment only. Please contact us for appointments or additional information. The number of patients suffering from diabetes in the United States is in the millions, which is expected to double in the next 10 years. The medical community is continuously improving the care for the diabetic patient and as a result their life expectancy has increased. That alone is remarkable, but there is an increase in lower extremity complications that comes with a longer life. These complications include peripheral arterial disease, peripheral neuropathy, foot ulcers, infections, and Charcot foot. These complications significantly increase the risk of limb amputation. Preserving limbs is the purpose of North Florida Amputation Prevention Center (N.F.A.P.C.). Your quality of life depends on the care received and we are dedicated to giving you the best that we can. We are working to make sure that lower extremity amputations are only as a last resort! Over the years, medical researchers found a number of therapeutic uses for the hyperbaric chambers. These chambers force large quantities of oxygen into the body very quickly. For example, hyperbaric oxygen therapy (HBOT) can speed the development of blood vessels, thus improving outcomes for certain types of wounds, gangrene, cardiac illnesses, brain injuries, autism and other conditions listed in this web site under HBOT Treatments. We would be pleased to answer your questions and discuss your needs. It is our hope to make this experience very positive and give you an opportunity to get well. We will work to facilitate your recovery! Please call for more information and to schedule your appointment. We will take appointments on weekends so that you do not have to miss work or school. Our goal is to assist in bettering your health and longevity – HBOT is not just for the sick or injured. Everyone can benefit from hyperbarics - we want to offer it to everyone. Please research HBOT on the Internet to get a real feel for your personal needs. A physical exam is completed before treatments begin. Then, a short health check is done prior to each treatment to insure your ability to use the chamber at that time. If your doctor clears you with a prescription and his medical records, the initial physical may not be necessary. We help children with Autism and Cerebral Palsy. We also treat Traumatic Brain Injuries, Strokes, Osteomyelitis, Crush Injuries, Compartment Syndrome, Crohn’s Disease, Migraine & Cluster Headaches, Wound & Burn Care, Sports Injuries, Pre- and Post-OP Surgery, Skin Conditions and Infections, and a majority of Neurological and Ischemic care. You will be in touch with every step we take and may even be able to do the treatment with them. Please browse this site to see what we treat and some of the wonderful treatments associated with Hyperbaric Oxygen Therapy. Most insurance plans cover hyperbaric oxygen therapy for specific conditions. Please contact your insurance company or our office for additional information. All fees are discussed before scheduling treatments.